In Hungary, the midsummer doldrums when there is absolutely no news to report is called uborka szezon, literally "cucumber season" because there is nothing at all happening and the newspapers actually run stories about how "the cucumbers are ripening." Although, this being Hungary, the stories tend to be about angry farmers dumping cucumbers in front of the Parliament because they all ripen at the same time and the prices fall and the farmers don't like that, except that Parliament is not in session until September so the farmers have already decided to complain about the apple season instead and dump apples next month, because at least the ministers will be back in their seats then and they can get some desultory TV coverage. Hungary is a simple place with simple needs for simple people. Among my simple needs are pickles. 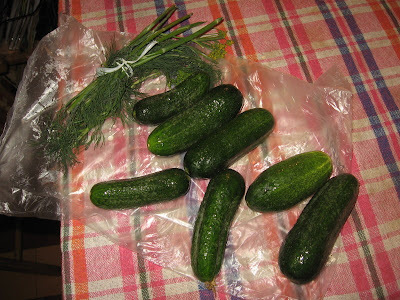 Not the usual dill pickles which you get in Hungary. 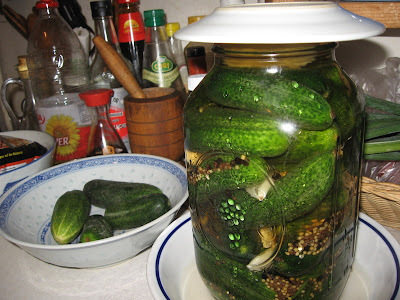 I specifically need New York Jewish style garlic half-sour pickles, and rather than complain about the lack of decent picklage in Budapest I long ago began experimenting with making my own New York pickles. The model, yea, the holy grail of the New York half-sour are the pickles at Katz's Delicatessen on Houston Street in Manhatten. Readers of this blog already know my attachment to Katz's, the only place in the world where I would not think of complaining about paying $15 for a pastrami sandwich. The sandwich is really only a vehicle for the mustard and pickle. And the New York half-sour garlic pickle is the perfect food for the summer, occupying that vaguely defined space between a raw veg and a salad. At Katz's the tradition is that you should tip the counterman a dollar - he'll cut your meat more generously, but more important, he'll dump a half kilo of mixed pickles on a plate for you. It pays to tip your man at Katz's. Part of the allure of Katz's is the pickles - you can get full sour or half sour, which are the bright green fresh looking pickles seen above next to an example of the world's best pastrami sandwich. Neccesity is the Mother of invention, they say, so I have learned to make my own. Luckily, during cucumber season, you can easily find the ingredients at any Hungarian vegetable stand. Kirby cukes and dill. I don't always like to use dill, but this time I gave it a shot. The results were fine, but my kitchen now smells like Finland, a land where dill and salt are the only flavors I can remember. 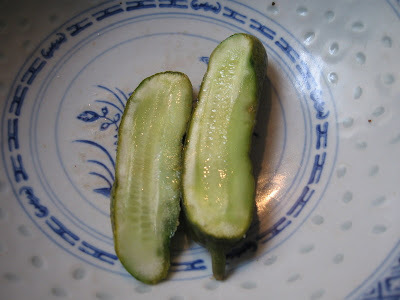 Wash the cukes well and prepare a brine of coarse salt (it is important not to use fine iodized table salt - which results in a slimey, soft pickle) water and spices. How much salt is tricky to explain - I just taste the brine until it aproximates the saltiness of regular pickle juice that you get from store bought pickles, otherwise I tend to over salt the brine. I add whole black pepper, mustard seed, coriander seed, and a hot chile pepper and then pack the cucumbers in a large jar with about a dozen cloves of crushed garlic. 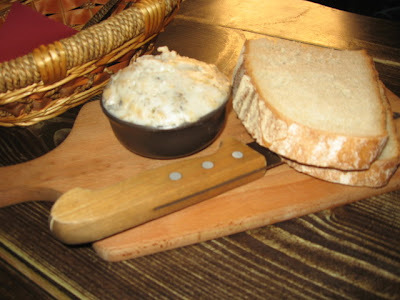 The sectret to Hungarian kovaszos uborka is to stick a slice of crusty bread on top of the brine to introduce yeast into the mix. I usually don't bother, but it speeds up the process and the New York style half sour cure takes only two days this way. You can use dill or not - I get annoyed at the smell of dill lingering in the kitchen after a few days, so I usually leave it out. It's the garlic aroma that I am really after anyway. The finished product. Not quite as crispy as a Katz's pickle (which I believe all come from Guss' Pickles on Essex Sreet anyway) but close enough. If I could, I would travel to my home town for the New York Pickle Day festival, at the New York Food Museum on Sunday, September 14, 2008. But if you need tips, the Museum had a page of pickle making tips. 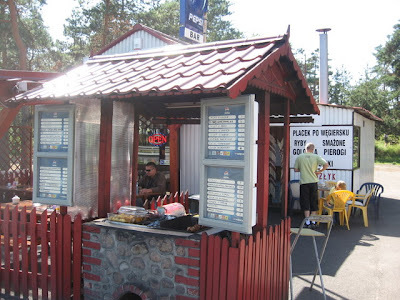 Polish Truck Stops: We Like Them. Very Much. 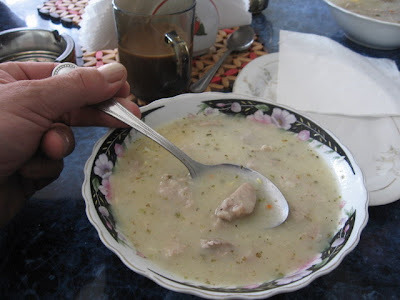 The slop pictured above is the heavenly soup known in Polish as zurek. Zurek is my default cheap meal of choice when in Poland, a thick, sour bowl of fermented wheat bran (the stuff we call cibere in Romanian) with bits of meat, kolbasz, and hard boiled eggs mixed in with some potato if you are lucky. This bowl cost me one Euro at a truck stop between Gdansk and the German border. Is there anything more welcoming than a Polish truck stop? 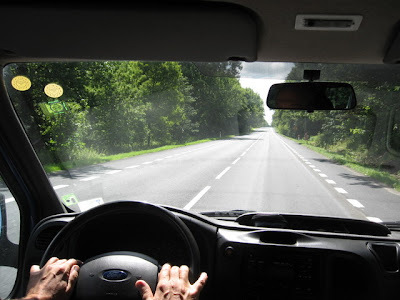 Driving around Poland is hard work - the country is surprisingly huge, and getting from Krakow to, say Gdansk takes about 13 hours of slow, careful driving down the narrow, crowded two lane country roads that serve as the main national highways in Poland. The Poles themselves are well aware of the shameful state of their highway system. Back in communist times, the Russians and their Polish communist lackies determined that keeping the roads narrow and undeveloped would slow down any expected NATO invasion force trying to reach Russia from Germany. Since 1990, however, there has been lots of EU funding for roads, but only short bits of highway near Warsaw and Gdansk were ever completed. The money went somewhere... but nobody really knows where. Unlike our system of roads in Hungary. In Hungary our previous conservative FIDESZ leadership realized early on that the Big Money was in road construction (especially if the Prime Minister's family owned the gravel pits and contracting firms... these guys definately stayed up late watching the Sopranos.) This is not corruption. This is simply very good New Jersey Logic. It's an old rule of thumb among certain ethnic groups in New Jersey that "there nothing that says ka-ching! ka-ching! like a new four lane highway overpass!" The Polish ruling elite need to learn from Hungary's example. Or start watching The Sopranos. 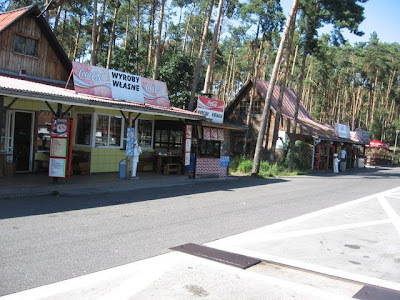 The basic Polish trucker stop is usually a simple shack located on on a small turnoff along the donkey paths that serve as Poland's national roads. Great big brawny guys named Stas and Janusz, often sporting huge handlebar moustaches, park their eighteen wheelers and wander up to the grill, maybe taking a shower out back (from a bucket shower rigged up to a tree) first to wash the road grime off. Poles are not avid vegetarians. Polish truck drivers in particular, are not prone to veganism, lacto-fruititarian, or organic bran diets. Poles eat meat. It makes them big and strong, which you have to be if you are located between Russia and Germany (had fate provided Poland with neighbors like, say Portugal and New Zealand, the Poles could have developed in an entrely different, more fragile and graceful way.) As it is they are the toughest kids on the EU block, fair but firm, the kind of nation you want to have on your team when the poop hits the fan... If you are just taking your first break from the last six hours of staring at asphalt, this is what a Polish trucker wants to see. Huge mountains of meat. 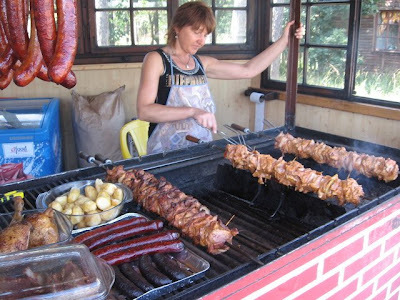 Pork chops skewered into a gargantuan, unkosher version of shish kebab, huge slabs of bacon, ham hocks, humoungous grilled chicken legs (from real, farm raised chickens, none of that supermarket chicken for our Polish truckers, no!) 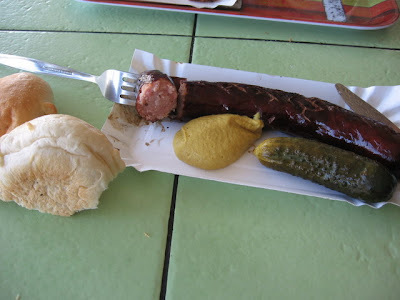 and great heaping sections of grilled Polish kielbasa and blood sausage. Growing up in the New York area, Polish kielbasa was one of the fondest memories of my mispent adolescence. Since we couldn't get Hungarian kolbasz very easily (short of a trip to the Hungarian butchers in the Yorkville section of Manhatten) my Hungarian Mom used to make do with Polish sausage. 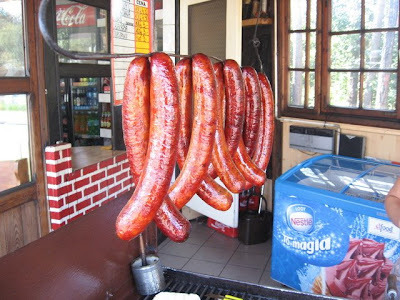 Polish kielbasa was also the lunch of choice when I worked on a sanitation truck crew in Hackensack, New Jersey. My garbage crew (six muscular black guys who moonlighted as the Gospel choir of their church and who used to practice singing while unloading huge cans of trash) would often stop on our way to the dump at a kielbasa shack in Garfield, NJ (population 50% Polish, 50% Hungarian) and demolish a few dozen grilled links before nine AM on any given morning. Of course there is more to Polish cuisine than truck stop chow. 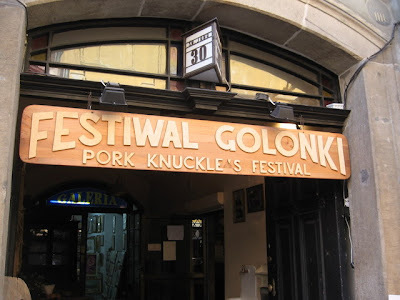 in Krakow, Fumie led me to the Restaurant Polskie Jadlo, which featured the Golonka Festiwal, a celebration of pig's knuckle in all its greasy, gelatinous glory. 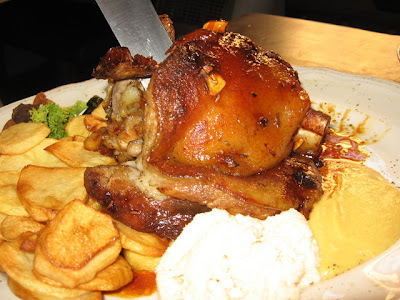 Golonka is roast pig knuckle, and it features on allmost every Polish menu. At the Jadlo this little joint of piggy goodness was offered in a dozen ways - we chose to split a big one in garlic and plum sauce, with a huge dollop of horseradish and mustard on the side. Eating these may well be illegal in the state of California, which is why we eat them in Krakow. And mind you, this is "light summer food" in Poland. Since we are all going to die anyway, we might as well know why. If the golonka isn't "mortality on a plate" enough for you, the starters definately were: pork lard mixed with pork cracklings and herbs, spread on thick slabs of Polish rye bread. You begin to notice a theme here, and that theme definately doesn't have anything to do with being kosher. Yes, I know that I will have a lot to answer for when I get to the Great Kosher Meal Plan in the Sky. But, doesn't God love a sinner? Or a fool. I'm not sure which. But fine cuisine alone is not what drew me to Krakow. We had a gig at the Harris Jazz Piano Bar, a lovely little basement venue located right on the Rynek square in downtown Krakow. Our host was the wonderful Gosia Michaelska, who we met in Budapest where she works on Polish cultural exchanges with the new Polish-Jewish bookshop on Nagydiofa utca. It was our first gig with Florin from Palatka, and the crowd - which came for straightforward klezmer - loved the Transylvanian Gypsy stuff we played for them. Fumie took the video below using a special Canon Belly-Increasing Macro lens, so objects seen in the video (such as my gut) may appear larger than they do in real life. Almost a month on the road is about enough for me for a good long while. We did the dance workshops for Klezmer and Roma dance at the Weimar Yiddish Weeks workshops, with guests Florin Kodoba and Sue Foy as dance teachers. We were all worried a bit about Florin as a dance teacher - he is a fiddler and an incredible dancer, but had not really done much teaching of Mezőség Gypsy dancing in his life. 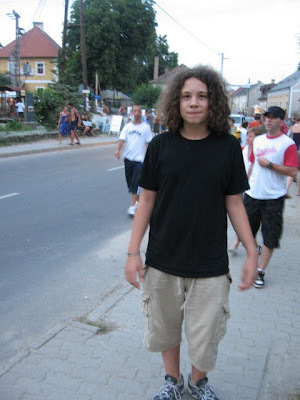 Still, he's grown up at events where his villages dances were the object of teaching, and he fell right into the job alongside Sue - patient and clear and breaking down the elements of the incredibly dense Transylvanian dance cycles of Palatka. New York Klezmer Wonder Boy, fiddler Jake Schulman-Ment, joined us for the concert and workshops. 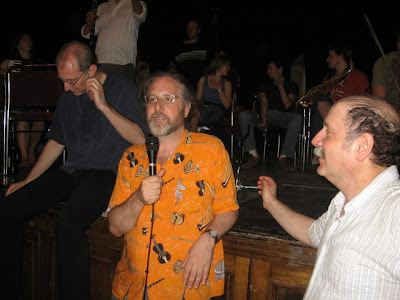 The Triumvirate of the Klezmer Dance Workshops, Michael Alpert, festival director Alan Bern (both of Brave Old World) and ethnomusicologist Zev Feldman. I would call them the Trinity of the festival, but, well, you know... it gets kind of uncomfortable using that term. Alan is a rock of patience, managing the demands of the participants and performers like the pro he is... if the man had less musical talent he could have been a rabbi. Or perhaps a sargent in the US Marines. Michael and Sue Foy backstage after our concert. 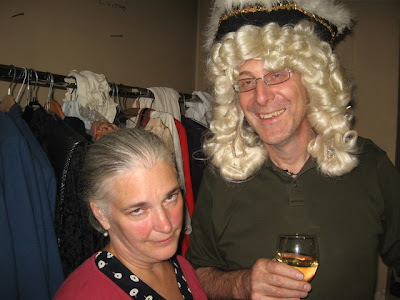 Never put Klezmer musicians in the same room as alchohol and theater costumes. It leads to silliness that may find its way to the public ("you didn't tell me you had a blog!") and hangovers. 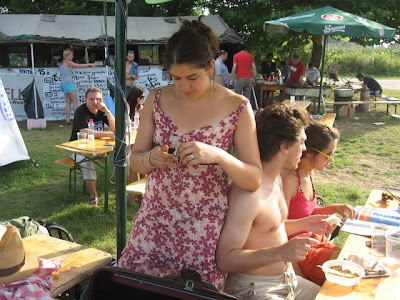 The hangovers needed to be kept in control because we had to be up and teaching by ten each morning - no small feat for a musician, given that we (well, not me... that often) were up late each night playing at jam session sponsored by cafes and bistros around Weimar. But we had a dedicated group of string players who asked for in-depth tuition from Florin about the Mezőség fiddle style. This is the only way one can learn this music - notation of the melodies on paper can never come close to the ornamentation and phrasing of a live performance. The trick to the dyanamics of the syle is all in the bowing, and the ornamentation can not be separated from the melody itself - they form one, dense, pulsating musical whole. This is a music that is "learned, but not taught" in its traditional context. 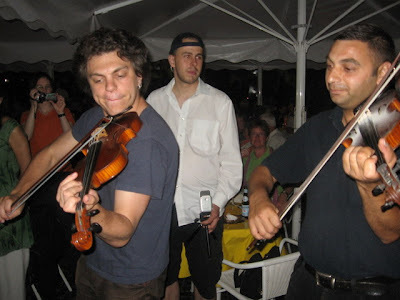 After the Weimar week, we tossed Jake and some of his french Klezmer friends into our mini bus for the ride back to Hungary, where we had been asked to play and teach workshops at the MAROM "Jewstock" festival in Monostorapati, near lake Balaton. This festival turned out to be... err.. less than auspicious. After the almost shocking effiencey of the Weimar seminars, the organization of the Hungarian festival was, how can we put this... fluid... actually it was a frigging mess. Our first day was... hopeless... But the organizers are good folks, so this is more of a "buy me a beer, I'll tell you a story" situation. At least it wasn't quite as fracked as the main festival in the neighboring village of Kapolcs, the "Magic Valley" festival. Magic as in "watch the performers disappear when they learn they ain't getting paid" because the festival lost all of its main sponsors months ago but decided to go on. 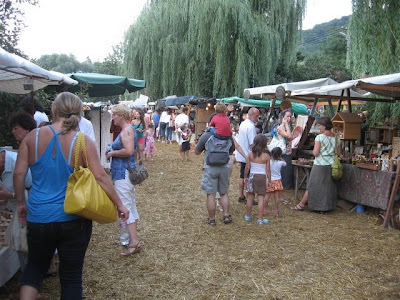 It was, basically, a bad crafts/boutique fair with overpriced beer and goulash, and very occaisionally, somebody playing music. I would have avoided the mess in Kapolcs altogether, but Aron was working as unpaid labor as part of his school project, in which his class worked on media interviews and tech help during the entire festival. I hitch hiked over one day to buy him some decent food. He wolfed down a salad first - his slave masters had forgotten to include fresh vegtables in the student media crew's diet plans - before wolfing down an excellent Serbian plescavica plate from the Kafana Restaurant's tent. He was happy though - he was given the rather impressive responsibility of being the production manager of the student media teams - I managed to do better eating at the small village bar in Monostorapati, where a decent serving of mutton stew with tarhonya (little lentil-sized pasta) ran only Ft 800 (EU 3.25) and the froccs was fresh and local. 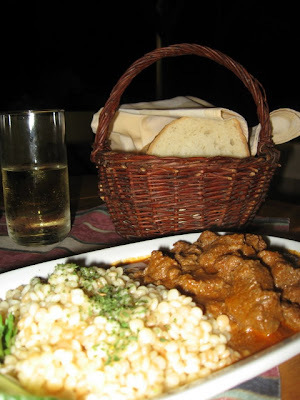 This is real Veszprem county food - you never get good tough sheep meat in paprika sauce in Budapest, and my roots are from Veszprem, so I was in mutton heaven. I couldn't really deal with the nightly music offerings down on the soccer field, which comprised mainly of Israeli rap bands which invariably featured Heroic Hebes in dreadlocks whacking away artlessly on djembe drums and darabukkas. It was seriously painful and tedious. 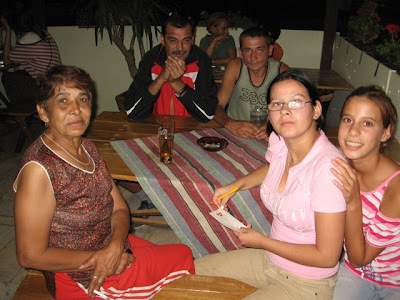 Instead, I wound up befriending a family of the local Beas (Boyash) Gypsies, who sang in the Beas dialect of Romanian and whacked artlessly on the top of the table for percussion (anything is better than an Israeli with a djembe.) The Beas are Gypsy in origin, but lost the use of the Romani language several hundred years ago while enslaved/enserfed by the Romanian nobility and used to work in mines (hence the name: Baias, or miner in Romanian.) The Beas are losing their language in Hungary, but these still spoke Beas, an older dialect of Romanian with admixtures of Serbian and Hungarian. When I was able to answer them in my own pidgin pan-balkanoid way, they were astonished. "You speak tsiganesht!" No, I had spoken Romanian, not Romani to them. But these were farm assistants, not linguists. On the other hand, the one Romani word they did recognize was useful a bit later when the wine flowed a bit to freely. "Patchiv!" Respect. Never met a Gypsy who didn't have a deep sense of respect, at least when expressed in their own language.